With the wide application of road studs in the construction of urban roads of our country, the quality and using life of road studs has been paid more attention. However, in the practical application, the road studs are damaged or the using time is reduced because of abnormal installation. 1. Being installed in the traffic lines. The traffic lines, which are attached to the surface of road, are drawn by resin material, and its connection with the road surface is in a certain limitation. If the road studs are installed in the traffic lines, the impulsive force received by road studs would pass to the traffic lines, which may cause the fall apart of road studs with road, which would also do harm to the traffic lines. 2. The road stud is installed in uneven place. If the installation place of road stud is uneven, it will cause non-uniform load of road studs directly, and the press on the road studs will focus on the raised and sink parts of them. The road studs will be broken if they are crushed by large-tonnage vehicles. 3. The road stud is not installed in clean space. The degree of soundness of road studs relies on the close connection of road stud, glue and the surface of road. If the installation space is not clean, the dust will reduce the adhesive strength of glue, which may cause the insecure of road studs. And they will fall apart when external force crashes them. 4. Too much glue or too little glue. If the glue is not enough, the soundness of adhesion will be reduced, however, the superfluous glue will leak out around the road stud with too much glue on it, and the glue may contact with the reflectors, which may have influence on the reflecting light of them. 5. Nonuniform glue on road studs. When install the road stud, the glue should not only be used in right quantity, but should be paint uniformly. In this way, every part of the road stud will full-stressed to avoid being broken because of nonuniformation. 6. Epoxy resin adhesive is not made in suitable temperature. Epoxy resin adhesive is the two-component adhesive, and the glue and hardener should be mixed with a certain percentage, and it will be effective only when they are mixed evenly. However, the epoxy resin adhesive will be condensed in cold winter days, which is not easy to mix evenly, so it should be heated after it soft enough before using the epoxy resin adhesive. 7. Not hold the road studs in the right way. 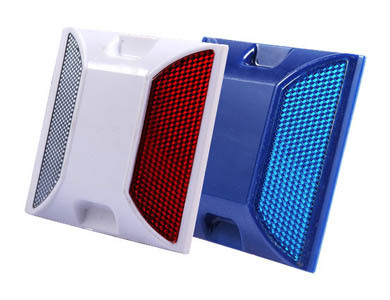 When holding a road stud, you should take the two sides without reflectors. If you do not behave this way, the glue may influence the reflecting light of the reflectors. 8. The installation hole site is shallow or thin. This tip is for cast aluminum road stud with a foot. The cast aluminum road stud with a foot has good shock resistance and pressure resistance, and it can be used for long time. But if the hole site is too shallow or too thin, the underside of road stud cannot connect with the road surface fully, which may influence the soundness of the road stud. After the installation of the road studs, it needs some time to solidification to connect the surface of road with the road stud tightly. In my opinion, the solidification time should reach 4 hours. But in real life, the isolation facilities will be removed 2 hours after the installation. And this is not good for the road stud. If it is crushed or crashed by cars, it may out of shape, but in some severe cases the road stud would fall apart with road. 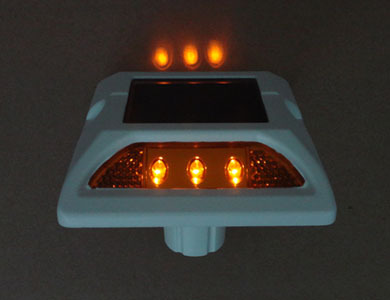 NOKIN TRAFFIC FACILITY is a professional manufacture and supplier for solar road stud, reflective road stud and other solar road signs. The products of it have been exported to many countries, including America, Canada, Costa Rica, Chile, Philippines, Japan, Russia, Romania, Ireland, Mozambique, Nigeria, South Africa, Australia, etc. Although NOKIN ranks in the leading position in this field, it can never slow down the pace for innovation, and it hopes to provide the most advanced products to the world. NOKIN aims to bring light and safety to every corner of the world.